The spacearound Earth is becoming more cluttered by the day with orbital junk that, ifleft unchecked, will pose an ever-increasing threat to current and future spacecraft, apanel of experts told a Congressional subcommittee on Tuesday. While spacedebris levels rose this year after the Feb. 10 collision between U.S. andRussian satellites, more rigorous tracking and cleaner spacecraft could help avoidsuch orbital smashups in the future, the panelists said. ?Thethreat posed by orbital debris to the reliable operation of space systems willcontinue to grow unless the sources of space debris are brought under control,?NASA?s chief orbital debris scientist Nicholas Johnson told the House Space andAeronautics Subcommittee in Washington, D.C. The Departmentof Defense?s Space Surveillance Network, which relies on a global network ofmonitoring stations, is currently tracking more than 19,000 objects in Earthorbit larger than four inches (10 cm), but there are an estimated 300,000 totalobjects bigger than a half-inch (1 cm) in size circling Earth. 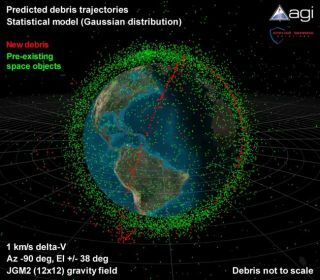 In 1980, thenetwork was tracking just 4,700 objects, about 2,600 of which were space trash. ?So in29 years, the amount of space traffic has quadrupled,? said U.S. Air Force Lt.Gen. Larry James, commander of the U.S. Strategic Command?s Joint FunctionalComponent Command for Space. February?ssatellite crash was the largest debris event since China intentionallydestroyed a weather satellite in a 2007anti-satellite test. But most of the man-made junk in space stems fromfragmentation events, in which old and malfunctioning spacecraft break apart orexplode. ?It isclear to me that if the spacefaring nations of the world don?t take steps tominimize the growth of space junk, we will eventually face a situation wherelow Earth orbit becomes a risky place to carry out civil and commercial spaceactivities,? said Congresswoman Gabrielle Giffords (D-Arizona), the committee?schair. The fastest way to reduce the risk to satellites and manned spacecraft fromspace debris is to enhance a pilot program by the Department of Defense toalert commercial U.S. and foreign satellite operators of potential collisionsso they can be avoided, Johnson said. That pilot project - the Commercial andForeign Entities program - is expected to become operational later this year,James added. There arealso efforts to upgrade the Space Surveillance Network, James said. The networkcannot continuously track every one of the nearly 800 satellites currently inorbit that have the capability to dodge potential collision. Efforts are underway to set up that capability by sometime next year, he added. If fundingcomes through for a planned Space Fence, which would use new sensors to fill innetwork gaps, it could boost the number of objects tracked in space from 19,000to nearly 100,000, James said. The Pentagon plans to launch a new satellitelater this year to test space-based debris monitoring assets, he added. RichardDalBello, vice president of government relations for the satellitecommunications firm Intelsat, also said that attaching government space debrissensors on commercial satellites is another possible countermeasure. Adheringto relatively simple practices, like venting a satellite?s fuel supply atmission?s end to avoid explosions and adding devices to catch severed bolts insteadof blowing them out into space, can be effective in limiting the growth ofunnecessary space trash, said Scott Pace, director of the Space PolicyInstitute at George Washington University. But other potential orbital mop upmethods - such as firing Earth-based lasers at trash in space, carry politicalissues beyond their technical hurdles. ?There?s afine line between a ground-based laser for cleaning orbital debris and aweapons system,? Pace said. ?So you?d have to have an amount of internationaldiscussion to decide whether that makes any sense.? CongressmanDana Rohrabacher (R-California) said that a while monitoring the space debrisenvironment is vital, a more effective means of cleaning up the orbital junkalready in space is also needed. ?If you?realready charting the course, all we have to do is get something up there thatwill knock it down,? Rohrabacher said. ?And that doesn?t have to be somethingso sophisticated. Just a big bulldozer in the sky, you might say.? Thesatellite collision above Siberia increased the risk of damage from space junkto spacecraft across a wide range of Earth orbits that include the Hubble SpaceTelescope, Earth observation satellites and astronauts aboard the InternationalSpace Station. It increased the risk to NASA?s station-bound space shuttles byabout 6 percent, or a 1-in-318 chance of damage, the space agency said. NASA plans tolaunch the shuttle Atlantis to the Hubble Space Telescope on May 11, though theagency has said the increased space debris environment at the iconicobservatory 372 miles (600 km) above Earth is one of the mission?s top risks. After a detailedanalysis, the space agency found the risk of catastrophic damage from spacedebris around Hubble to be about a 1-in-221 chance, within acceptable limits.NASA?s guidelines call for no greater than a 1-in-200 chance of serious spacedebris damage. The spaceagency plans to position Atlantis in an orientation that provides extraprotection for astronauts working outside the shuttle during the Hubble repairmission?s five spacewalks. The shuttle will also fly into a safer orbit soonafter completing its work at the space telescope, NASA officials said. A secondspace shuttle, Endeavour, is also on a separate launch pad and poised to serveas a rescue ship if needed, should Atlantis be critically damaged by spacedebris.